Invasive Ideology: The War for Hegemonic Truth separates the bravado, posturing, indignation, and marketing fluff of belief systems from the real socioeconomic results brought about by cultural transformation, continuing Nietzsche’s incomplete legacy of the “re-valuation of all values” – as only a postmodern American millennial can. Andrew treats innovation and re-valuation as not only creation of something new (or defense against it), but also a war to we wage to force other ideological systems evaluate our truth-creation the same way we do. Because we tie this intimately to the very notion of value, significance, and purpose as societies, progress and revolution are frequently over-glorified or treated with superstitious suspicion. 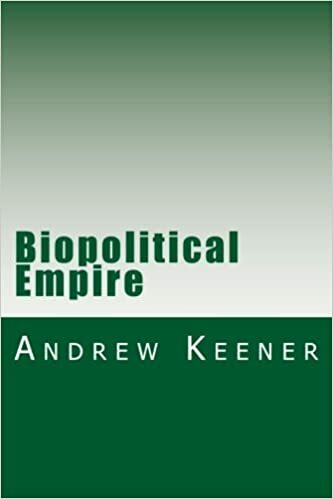 Andrew Keener presents the doctrine of Maneuver Economics, a postmodern conceptualization of fighting and winning the wars of invasive ideology. Invasive Ideology is characterized by the complex interaction of macro-organic, economic, psychological, and intellectual factors of signification-production. The market characteristics of innovation are generally easily seen, understood, and measured: equipment capabilities, resources and capital, market objectives, number of members, losses of finance or layoffs, market share (or believers) lost or gained, patents or key assets obtained. The psychological characteristics of totalitarian re-valuation are less tangible. Complete re-valuation of all values rewrites history by disrupting the signification of all signals, the same way we can never complete an accurate cognitive signification of the Greek myths as they were understood by Alexander The Great, or the writings of the prophets Isaiah as understood by the People of Judea during the terrorism of Antiochus IV Epiphanes. This is the destructive instantiation of The War Machine that Invasive Ideology manifests – it is not enough for fundamentalist to win power, they want to ensure the access to all power, capital, truth, spirit, libido by any future belligerents is utterly unraveled. Now we see clearly­ that the genesis of The War Machine lies precisely in the collective madness of any totality that is willing to invoke it. Neither the Judge-Priest nor the Magician-King of the Organs of Power can extend their vision to a past or a future in which each alternative dimension of Hegemonic Truth has been eradicated. Only selling the collective over-soul to The War Machine can achieve the unravelling of all adversarial valuation-signification; thus, the Capitalist needs the Singularity, the Christian needs the Apocalypse, the Communist needs the idealism-totality of Universal History, and Freud needed the death instinct more than the libido. It is precisely the problem of the multi-construct, multi-dimensional complex adaptive recording system that makes the psychological factors of production-valuation dauntingly difficult to grasp and impossible to quantify. We cannot easily gauge the role of resolve, conscience, emotion, fear, courage, morale, leadership, or will-to-power. Every calculi in the effort observe a single causal chain is riddled with jump discontinuity. Innovation also involves a significant intellectual component. Intellect provides the ability to grasp complex systems; to make effective estimates, calculations, and decisions; to devise tactics and strategies; and to develop plans. Although material factors are more easily quantified, the psychological and intellectual factors of production exert a greater influence on the nature and outcome of innovation.